Is it any ChasePlane profile for Vega (presets)? Just question, I took CP yesterday and I fall in love to this tool ! If not I'll create it. I'm using Chaseplane as well and set up a few views. Nothing fancy, just a replacement for the default views and some external cameras. I just shared my camera settings in the community tab, but I saw that there's also camera definitions by MD67, which pop up when you search for "Wing42". Ok thx Vitus . I’ll check. 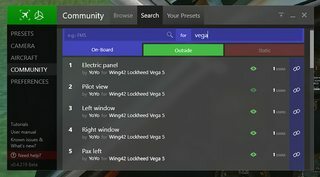 I did profile of ChasePlane for Vega, if You like You can find it in CP, Community menu (Vega, author YoYo).